I'd like to welcome author and matchmaker extraordinaire Marla Martenson to Book Club Exchange, a regular feature on Booking Mama which highlights anything and everything book club-related! 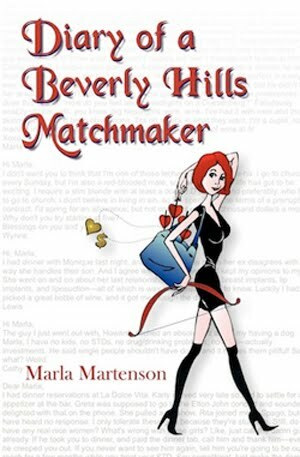 Her most recent book DIARY OF A BEVERLY HILLS MATCHMAKER gives readers an insider's look into Marla's life as a matchmaker. And, according to Marla, it's a perfect summer pick for your book club! Has our society become to shallow, if if so is there any way to turn it around? For the single people in the group, what is the best and worst date you have been on? For married people, do you ever wish that you could be out there dating again or are you soooo glad that you don't have to contend with it any longer? Also the subject of work comes into play. Marla is clearly burned out on her job even though she is helping people, she finds herself in the doctors office more often than she would like from the stress of her unrealistic clients and insensitive boss. What is the limit you would to before quitting a job that was making you sick? Welcome to the world of Marla Martenson. The Cupid of Beverly Hills, she has introduced countless couples who have gone on to get married and live happily ever after—so far. But for every success story, there are more dating disasters, high-maintenance clients, out-of-touch men (and women), and downright comical situations with which she has to contend. In Diary of a Beverly Hills Matchmaker, Marla takes her readers for a hilarious romp through her days in an exclusive L.A. matchmaking agency and her daily struggles to keep her self-esteem from imploding in a town where looks are everything and money talks. From juggling the demands her out-of-touch clients and trying her best to meet the capricious demands of an insensitive boss to the ups and downs of her own marriage with a Latin husband who doesn’t think that she is “domestic” enough, Marla writes with charm and self-effacement about the universal struggles that all women face in their lives. Readers will laugh, cringe, and cry as they journey with her through outrageous stories about the indignities of dating in Los Angeles, dealing with overblown egos, vicariously hobnobbing with celebrities, and navigating the wannabe-land of Beverly Hills. In a land where perfection is almost a prerequisite, even Marla can’t help but run for the Botox every once in a while. Marla Martenson was born in Tacoma, Washington, the “City of Destiny.” She has a natural flair for acting and a deep interest in reading and writing poetry and short stories. At the age of sixteen, Marla was living in Iran with her family, learning to speak French and Persian, when the revolution forced their return to Washington State. After a year of college there, the pursuit of an acting career drew her to Hollywood and a stint in television commercials and print modeling. Restless and eager for new challenges, in the early nineties it was on to Chicago, where she discovered that she could use her personal dating experiences to help others. She subsequently turned this talent into a career as a matchmaker back in Los Angeles, where, since 2001, her skills have led many couples to matrimony. She found and married her own, musician and composer Adolfo Jon Alexi, in Mexico City in 2002. Currently, Marla writes for such online publications as www.naomishow.com, (www.abfabwomen.com) and Examiner (www.examiner.com). She was named the “Over 40 Female of the Week” in February, 2010, for Over40Females.com. She is also a correspondent for World Wide Good News. Marla is the bestselling author of three books, Excuse Me, Your Soul Mate Is Waiting (Hampton Roads Publishing, 2008) and Good Date, Bad Date (Hampton Roads Publishing, 2009), her latest, Diary of a Beverly Hills Matchmaker (Bettie Youngs Books), is now available at bookstores and on Amazon.com. I am so grateful to Marla for sharing some of the discussion-worthy topics from her latest book DIARY OF A BEVERLY HILLS MATCHMAKER. If you are interested in participating in a future Book Club Exchange, please contact me at bookingmama(at)gmail(dot)com. Those do sound like great book club questions - or conversation questions in general! Thanks for the fun post! Oh, the fun my book club could have with those questions! Most of us are married, but we do love to live vicariously through the single folks! That does sound like a good book! What an interesting job.